Who really built Venice, California? Was it the land barons? Was it the city planners? Was it Venice's founder, Abbot Kinney? Mr. Kinney may have had the vision. The African-American community had the muscle. The massive wetlands that would become today's Venice had to be dried out to support the construction of stable structures that would one day be the Venice canals. And so the dredging began. African-Americans were relocated to the Venice area to dig the canals under a fast-approaching deadline. Opening day with tremendous pomp and circumstance was scheduled for July 4, 1905. A massive storm had hit the Venice shoreline and had destroyed most of the pier on Windward Avenue earlier in March of that year. The completion of the Venice Canals appeared impossible. The African-American community made it happen. While most of Venice was completed by opening day, few knew of all of the contributions by African-Americans. Arthur L. Reese, for example, arrived in Venice from New Orleans in 1905 and recognized the need for janitorial services in the newly created town. Through a series of fascinating events, Mr. Reese took over an existing local Venice company and became head of the first African-American family to live and work in Venice, California. Another African-American, perhaps better known to generations of Venetians was Irving Tabor, Abbot Kinney's confidante and personal driver. He drove Mr. Kinney everywhere. When their travels took them to the south, they slept in Kinney's automobile as African Americans were not allowed to sleep in hotels that accommodated whites. This was the same sort of prejudice that required Venice's African-American residents and visitors to use only black colored gondolas, while whites could ride in any of their choosing. 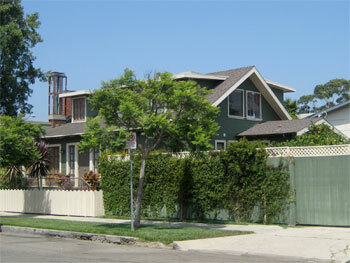 When Abbot Kinney died in 1920, he willed his Venice home to Irving Tabor. But that same prejudice reared its ugly head once again and prohibited Mr. Tabor from living there. Undeterred, he sawed the home in half, got his mules, and used those same canals to move his new home to it's current location on the corner of 6th and Santa Clara in Venice. Descendents of the original Venice African-American community settled in and developed the 1.1 square mile area known as the Oakwood neighborhood. Today, gentrification threatens to change the fabric of the Oakwood neighborhood in Venice. But its rich history lives on. Learn more about the history of Venice's African-American community on your Venice Beach Walking Tour.